Student Schedules will be ready to pick up at the dates and times listed. Please come by and pick up your student schedule. We are so excited to start the 2018-2019 School Year! August is just around the corner and that means school will begin soon for Tenaha students. The Roarin’ Band from Tiger Land, grades 9-12, will began practice Friday, July 27th for leadership and percussion and full band practice will began today, July 30th. (Please see the Tenaha Roarin’ Band from Tiger Land Facebook page or go to www.tenahaisd.com for a complete band practice schedule.) Brian Sours, Band Director, anticipates a great year for the Roarin’ Band from Tiger Land! Tenaha Youth Center's Summer Meals for Kids Program began July 2nd , and will serve every Monday, Wednesday and Friday until school starts in the fall. CMS Schedule pick up will be on Thursday, August 9th at Meet the Teacher and 6th-grade orientation. The information in the parent portal may not be correct until this date. 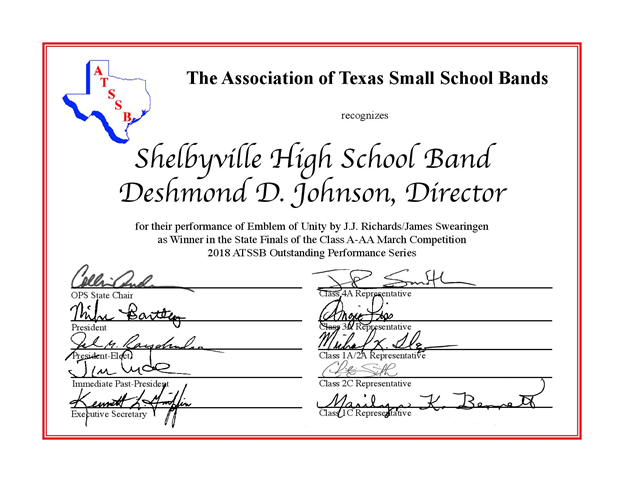 The ATSSB Outstanding Performance Series is a program designed to annually select the most outstanding Class 1C, 2C/3C middle school that feeds an ATSSB-eligible high school, 1A/2A, 3A, and 4A concert band performances in the state of Texas each year. A compact disc of the winning selections will be made available to all high school band directors who are current members of ATSSB and to public radio stations that will broadcast the performances. It will provide a series of recordings that demonstrate the highest level at which Texas small school bands perform. The second session of Shelby county tennis clinics will be held July 30 - August 2 at Center High School. Please contact Leon Dykes to sign up. JISD Student Athletic Physicals will be held on Thursday, August 2nd at 9:00 am in the New Gym. Physical cost is $15 per student. It’s almost Football Season!!! 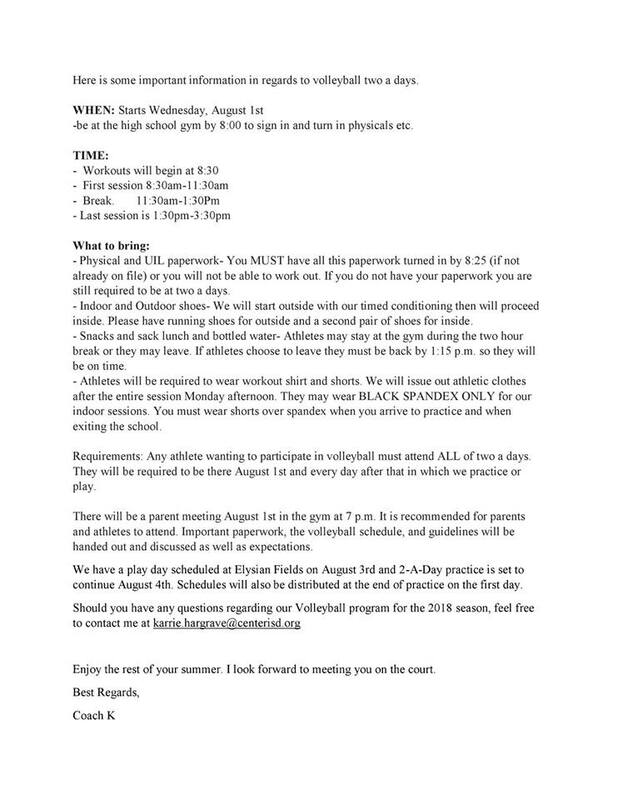 The first 2 weeks practice schedule is listed below. This is the HS schedule... JH starts after the 1st day of school. 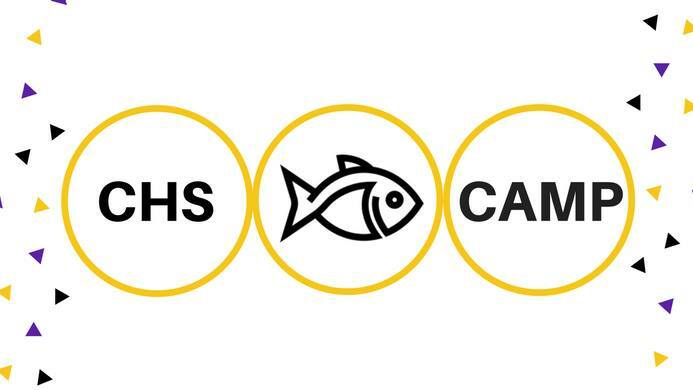 Incoming Center High School freshmen are invited to join faculty and staff for FISH CAMP! Yearbooks will also be available for preorder - Receive a Fish Camp discount off of the $45 price! Cash/check available. Joaquin ISD has scheduled its annual substitute orientation and training for Wednesday, July 25th at 10:00 am in the Joaquin ISD Staff Development room. Please be sure to complete and or update an online application at www.joaquinisd.net under employment opportunities. A Cross Country parent meeting will be held on Friday, July 27th at 6:00 PM. The meeting will take place in the Center High School cafeteria. All Cross Country information will be covered including coaches' expectations, weekly schedule and competition schedule. Please contact douglas.boone@centerisd.org with any questions or concerns. FFA News - Parents that have kids signed up to show at the 2018 Poultry Festival have a mandatory meeting August 7th at 6:00 p.m. at the County Extension Office in Center, Texas and Margo Hooper has forms at the Ag Shop that they need to come fill out by Tuesday, July 31st . 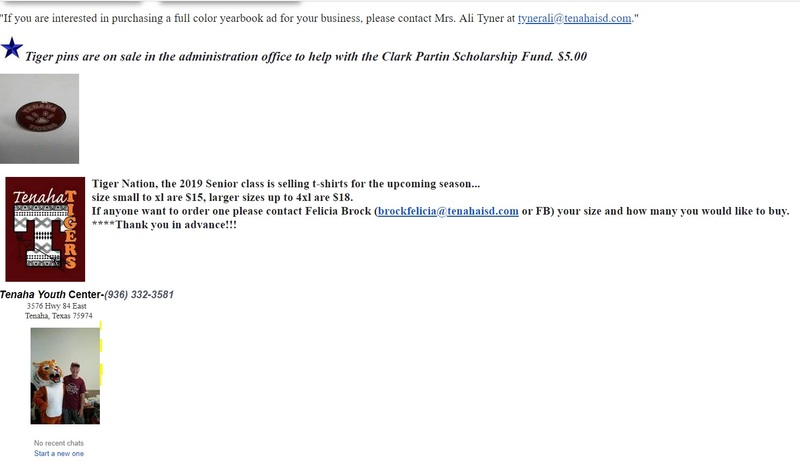 They can call Mrs. Hooper at the Ag Shop at 936/558-4211 if they have questions or concerns. On Wednesday, July 18, a representative of the Gas Compressor Association, Mr. Gary Farr, from Cummins, presented Dr. Gregory Powell, President of Panola College, with a check for $14,000. This generous donation will be used to help enrich and grow Panola College’s School of Energy. 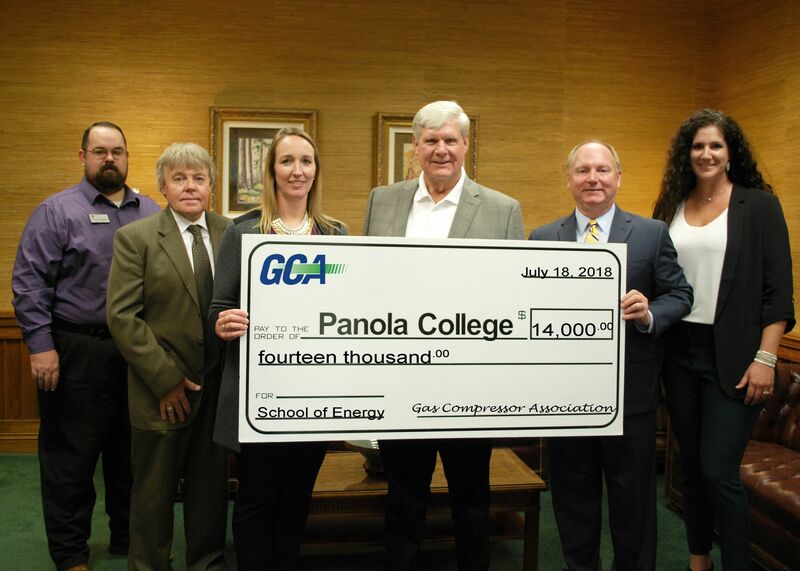 The GCA has a long relationship with Panola College, wherein the Association supports the effort of the College to produce potential employees that want to make a career in Gas Compression. Parent/guardians will be asked to complete a survey as a part of the enrollment process across the campuses; surveys will be a part of the enrollment packets provided to students. 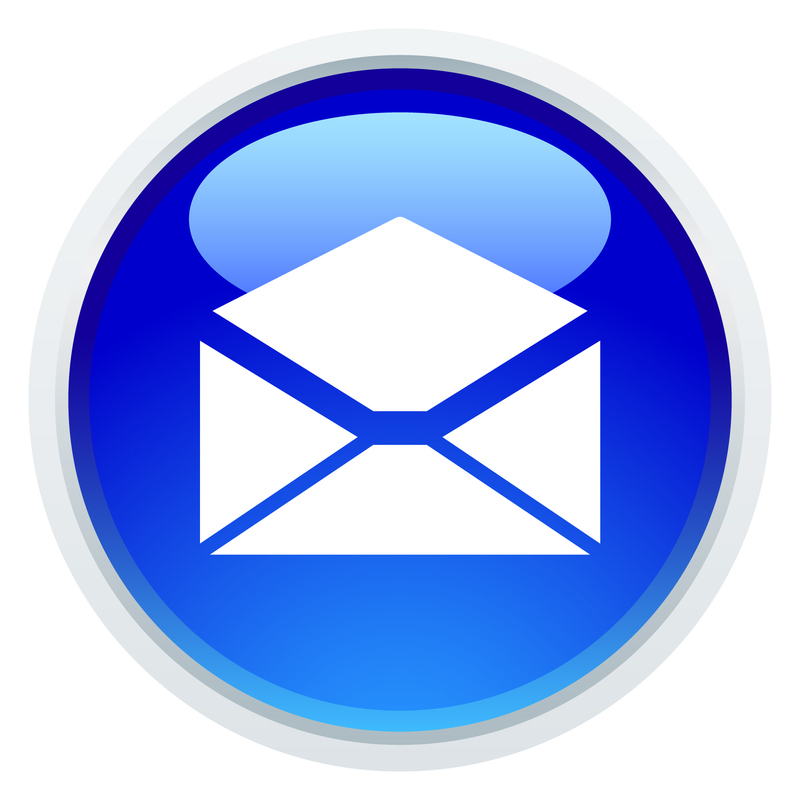 In addition to paper surveys responses, answers can be submitted online. Surveys are in English and Spanish and are designed to secure feedback regarding career and college readiness resources. Data collected will provide information that can be used to strengthen services to the families in the district. Center ISD will be holding their annual Substitute Orientation on Tuesday, July 31, 2018 from 8 AM to 12 Noon at the High School Library. All district substitutes are required to attend to go over policies for the upcoming school year. Those interested in substituting for the district are encouraged to complete an online application by visiting the district website at www.centerisd.org under Human Resources and Employment. 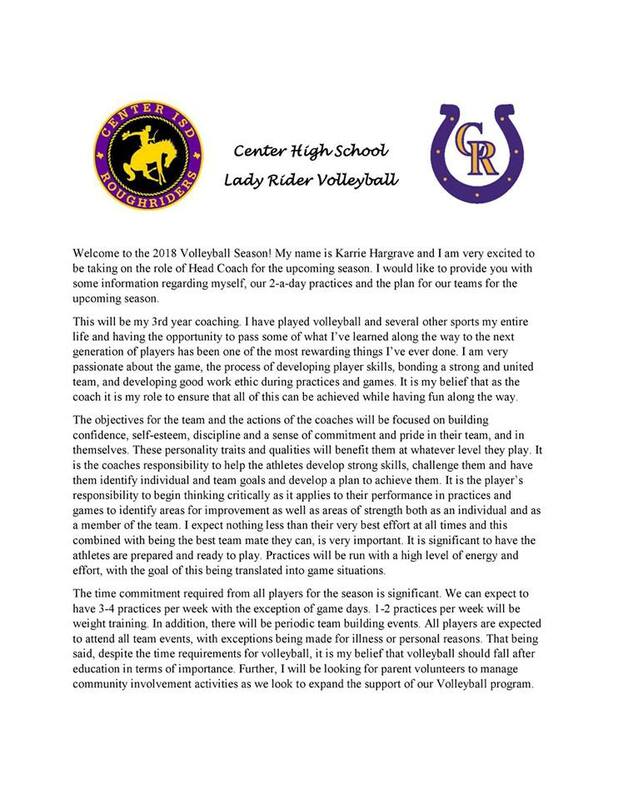 For more information or questions please contact Holly Mikesh at 936-598-5642. SFA will hold a public ribbon cutting for the Ed and Gwen Cole STEM Building at 1:30 p.m. Tuesday. Today, The Chronicle of Higher Education named Panola College as one of the “Great Colleges to Work For” and presented the institution the Honor Roll designation for the seventh consecutive year. One of the largest and most respected workplace-recognition programs in the country, “Great Colleges to Work For” identifies colleges and universities that work to provide an exemplary work environment for faculty and staff. The results, released today in The Chronicle’s eleventh annual report on The Academic Workplace, are based on survey responses from more than 53,000 people at 253 colleges and universities. The primary factor in deciding whether an institution received recognition was the employee feedback. Panola College is listed as one of only 84 institutions that achieved the “Great College to Work For” recognition and one of only 12 two-year institutions to make the Honor Roll, which recognizes distinguished institutions for creating exceptional work environments. Collaborative Governance: Faculty members are involved appropriately in decisions related to academic programs. Confidence in Senior Leadership: Leaders have the necessary knowledge, skills and experience for institutional success. Facilities, Workspaces and Security: Facilities adequately meet needs, the appearance of the campus is pleasing, and the institution takes steps to provide a secure environment. Job Satisfaction: Provides insight into the satisfaction with job fit, autonomy and resources. Professional/Career Development Programs: Employees are given the opportunity to develop skills and understand requirements to advance in their careers. Supervisor/Department-Chair Relationship: Supervisors make expectations clear and solicit ideas. Teaching Environment (Faculty only): Faculty members say the institution recognizes innovative and high-quality teaching. Work/Life Balance: Policies give employees the flexibility to manage their personal lives. “Great Colleges to Work For® looks at employee perceptions of the quality of their work environment. It examines aspects of the worker experience in a quantifiable and measurable way. This allows you to act on your faculty’s and staff’s feelings about job satisfaction, interdepartmental collaboration, pride in work and other important areas,” states Liz McMillen, editor of The Chronicle of Higher Education. Great Colleges to Work For is one of the largest and most comprehensive workplace study in higher education. To administer the survey and analyze the results, The Chronicle worked with ModernThink LLC, a strategic human capital consulting firm that has conducted numerous “Best Places to Work” programs, surveying hundreds of thousands of employees nationwide. Tenaha ISD will have a school board meeting on July 16th at 5:30 p.m. 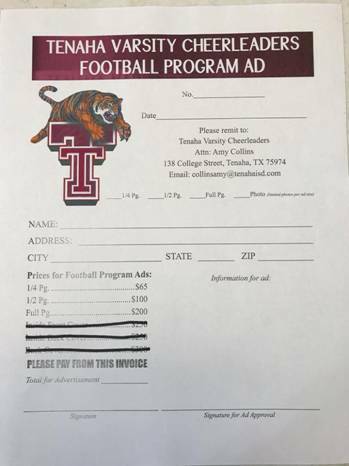 Deadline for FB Program Ad is July 23rd. Timpson ISD Students Earning College Hours This Summer - Timpson High School students are working to better themselves this summer. Timpson Collegiate Center has had 74 students enrolled in classes during the Maymester, Summer I session, and Summer II session. Timpson ISD is encouraging students to continually better themselves and understand the value of working hard to become strong working members of our communities. Mr. Richardson the Dual Credit Program Coordinator credits the high passing rates and the high enrollment rates to the motivation of the kids. Mr. Richardson explains that the mentoring and monitoring foundation given to these students has supported the 93% passing rate over the 2017-2018 school year in these college classes. Timpson ISD is excited to graduate 95% of its Seniors with either an Associate’s Degree or a technical certification. We encourage you to visit our district. It’s Never Been a Better Time to Be a BEAR!! Timpson ISD/STEM Academy Attends SFA iMAS Camp - Incoming Timpson Junior High Students recently attended SFA’s iMAS Camp. Investigations in Math and Science (iMAS) Camp is one of many programs that the SFA’s Stem and Research Center offers to local students that provides a variety of “hands-on and minds-on” learning experiences. Five students from Timpson ISD took advantage of the iMAS Camp and enjoyed an engaging week of activities. Upon arrival at SFA students were divided into teams and given instructions for the day. The students quickly were led to their separate locations throughout SFA’s campus including the new nursing facility off-campus. Students participated in a new activity each day. One day the students participated in a “who done it” forensics activity in which they used clues from a simulated crime scene to find the culprit. A second activity included a study of genetics and DNA, the students created a necklace filled with their DNA after an in-depth research of how to obtain and view their DNA. A third activity included coding with the LEGO EV3 robotic vehicle. Students had to incorporate their math skills with their computer skills in order to make the vehicle perform a variety of maneuvers. The next activity allowed the students to perform a lab experiment with colors created from natural plants. The students received a series of berries, carrots, and other materials and used the items to create all-natural dyes. At the end of the lab the students were to create a new SFA emblem using the dyes they created. The last activity was completed at the new SFA Nursing facility. Campers were allowed to work with robotic patients. All Timpson students learned how to take a pulse, count respirations, get a general medical background for a patient, and even learned how to start an IV. Stephanie Stone, Timpson ISD’s 5th grade math teacher, stated that the students and faculty at SFA did an amazing job with the students. They explained step-by-step what to do at each station and ensured that all students were safe and stayed on task. Mrs. Stone was very happy to see the students enjoy learning on their summer break. “We can’t wait to participate again!” stated Gracie Pledger. Throughout the week Mr. Bubba Carrington and Mrs. Stephanie Stone took the students to SFA’s campus and spent quality time with their students. Mr. Carrington stated, “This is what we do. We are here for the students. We want the students to have a passion for learning and create a rapport with their educators that lasts a lifetime.” Timpson STEM Academy would like to thank Dr. Redfield and her staff at SFA for this opportunity. A regular meeting of the Board of Trustees of the Shelbyville Independent School District will be held on Monday, July 9, 2018, beginning at 12:00 p.m., in the Board Room of the Shelbyville Independent School District at 343 FM 417 West, Shelbyville, Texas.